After lived in Florida for so many years, I did not want to go back to the ocean view. I enjoy mountains and change of a seasons more than salt water and hot sun, but the thought about looking at the cliff coast is still excites me. Luckily, there is The Calvert Cliffs State Park just in 1 ½ hours’ drive away. Our trip to the Chesapeake Bay was completely unplanned but I knew that I want beautiful pictures of the water and cliffs, preferably illuminated by the morning sun. And so we’ve have spent the first day looking for a good position for early morning shoot, and our first stop for near 4-mile loop hike was in The Calvert Cliffs State Park. At the beginning, kids were thrilled with the excitement about going to the beach, but their excitement vanished not sooner we reached 0.5 miles mark of our 1.8-mile red trail to the beach. Which was odd because both of them were not newbies in hiking. The red trail hike is a very nice and well-maintained trail. It is perfect for the family time as it passes through the marshes and swamps with many beaver dams and chewed down trees. On the way to the cliff, we saw Red-eared slider (turtle), Northern green frog and non-venomous Rough green snake into which I almost barged. All the trails in the Calvert Cliffs State Park lead to the Chesapeake Bay, where you can find lots of fossils and shark teeth on shore, and of course enjoy the cliff view. The most amazing opportunity that I have got as a photographer was a flock of vultures preying on the dead sea-turtle. Heartbreaking. But I’m sure you don’t see that every day! It took me time to realize that there were two types of vultures in the photos: Turkey and Black. The most noticeable difference between these two species is the color of their head: red for the Turkey vultures and dark gray for the Black vulture. However, the juvenile Turkey vulture resembles the Black vulture in having a dark head and bill. In that matter similarity, let me draw your attention to this one particular difference: the Turkey vulture has huge nostrils whereas those of the Black vulture are not particularly noticeable. Maybe this nostrils factor made the Black Vultures unable to have as keen a sense of smell as Turkey vultures that is why they more often hanging around with Turkey vultures and letting them sniff out a meal. When seeking food Turkey vultures tend to fly just above a forest canopy trying to pick up its scent. 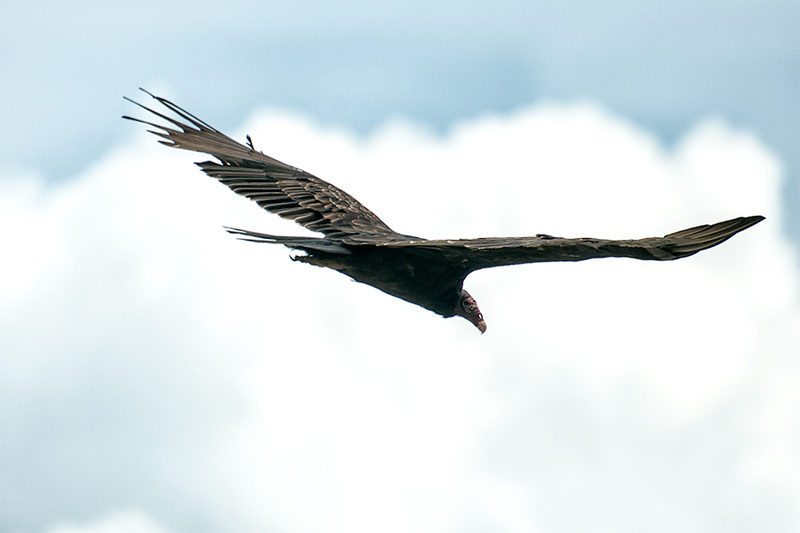 Black vultures often soar above the Turkey vulture, waiting for the Turkey vulture to find some food. The Black vulture, with its choppy wingbeats and labored glides, cannot match the Turkey vulture’s majesty in the air.. The turkey vulture’s sense of smell is so sensitive that it can detect the low quantities of chemicals released from animal that have died very recently – they prefer their food as fresh as possible. Turkey vultures usually eat alone. If more than one Turkey vulture has gathered around a food source, the dominant male eats by himself first, and when he is done, whoever is next in line of the hierarchy eats second, and so on. In contrast, Black vultures frequently approach their food as a flock. Both Turkey vultures and Black vultures have bald heads. This prevents bacteria-laden gore from being stuck in their feathers. Neither the Turkey vulture nor the Black vulture bother building a nest for their eggs. Typically, they just lay their eggs on the ground somewhere, although they have been known to find a hollow tree. Turkey vultures are monogamous and mate for life. Black vultures are also monogamous, but they prefer serial monogamy to the lifetime variety, though they may stay together with a mate for a number of years. In self-defense both Turkey vultures and Black vultures does their signature move: it vomits on the predators. Not only is the vomit putrid (consider what the birds have been feeding on) but the mass regurgitated from the stomach will contain strong acid, which causes an acid burn. Vultures enjoy their own unique holiday, International Vulture Awareness Day, celebrated on the first Saturday of each September. The holiday is a way to raise awareness about these unique birds, and hundreds of zoos, aviaries, nature preserves and bird refuges worldwide participate each year with fun and informational activities about vultures. After the Calvert Cliffs State Park, we went to the Duncans Pond at Flag Ponds Nature Park. Where we have found some pretty birds such as Green Heron, Great Egret and Ospreys. However, because of the late evening I was not able to take good photos of those creatures. All birds was too far away and only luck that I had was with one Osprey on branch in the evening lite. In spite of the fact that we were so exhausted by the end of first day, it turned out to be full of surprises and beauty. The second day on the Chesapeake Bay was not less impressive then first one. The Paw Paw Tunnel is one of the major features of the canal, built as a bypass to some very difficult terrain along the Potomac River in Paw Paw Bends. Here the river makes a series of gargantuan loops; the tunnel route cutting across one large double loop takes 1 m where river takes six. While tunnel route involved cutting thru 3118' of solid rock, the Maryland shore of river route contains some impressive cliffs coming right down to the river. A long time I have loved the sunned mother-of-pearl of your body. I go so far as to think that you own the universe. I want to do with you what spring does with the cherry trees. Vanderbilt’s 250-room French Renaissance chateau is a true marvel, the largest undertaking in residential architecture. Over a six-year period, an entire community of craftsmen comes together to create America’s premier home and the environmental wonderland that surrounds it. The country retreat George Vanderbilt has spent so long planning is marvelously decorated and full of festivity. On Christmas Eve 1895, Vanderbilt officially opens Biltmore to friends and family. The finished home contains over four acres of floor space, including 35 bedrooms, 43 bathrooms, and 65 fireplaces.